At the dawn of the Empyrean Age, CONCORD faced its first crucible and failed to prevent interstellar war from breaking out yet again. Like the Gallente in the first part of this series, in the previous chapter the Caldari fell under the rule of nationalistic radicals. In this third and final installment, a new status-quo emerges as this age-old conflict enters the present day. When Empress Jamyl Sarum returned after she was considered dead, and devastated the Elder Fleet, the blockade of CONCORD came to an end and they regained control. The attacks on both Amarr and Gallente space taught them that peace between the empires was a fragile thing and that hostilities could flare up at a moment’s notice. To prevent massive interstellar warfare and yet provide an outlet for such tendencies, CONCORD drafted a new regulation, the Emergency Militia War Powers Act (EMWP). This decree would restrict all direct warfare between the four major powers, but at the same time allowed for the formation of militias which could contest any disputed systems. Most notably, those quasi-independent forces were allowed to include capsuleer pilots and their corporations. At last, the pod pilots became a party in the conflicts between the empires of New Eden when the Gallente formed the Federal Defense Union and the Caldari created the State Protectorate. Immediately, loyalist capsuleers began to fight over systems in Placid, Black Rise and other border regions. Initially, the Gallente Federal Defense Union proved highly successful but even as capsuleers gained ground, the Federation itself went through yet another phase of political crisis. President Souro Foiritan had previously been a highly popular leader, so much so that he managed to get a resolution passed by the senate which allowed a president to serve a second term, and he was reelected to office. His failure to prevent the invasion of Caldari Prime and the all-too-quick peace settlement however, severely tarnished his public image. During that backlash, Senate leader Mentas Blaque used public opinion to leverage even more pressure on the president. Souro Foiritan proved to be a skillful political player though. Forced to assert his power, he instigated a widespread campaign to hunt down the traitor Anvent Eturrer, while emphasizing that his settlement with Tibus Heth was born out of the desire to save lives which inevitably would have been lost. To demonstrate his dedication to justice and the prevention of further high treason, President Foiritan authorised the formation of a new branch of Federation Intelligence: the Special Department of Internal Investigations and Federal Security (SDIIFS). In reference to their symbol – the black eagle of the Federation arms – this organisation soon became known as The Black Eagles. By appointing his rival Mentas Blaque as leader of the Federal Intelligence Office, Foiritan appeased the man and removed him from the public stage at the same time. By the end of YC 110, the president was provided with the perfect opportunity to regain public support. An attack on Gallente space by Amarrian heir Uriam Kador was repelled during a resounding victory for the Gallente Navy. That gave Foiritan an opening to negotiate with the newly crowned Empress Jamyl to be allowed access to Amarr space for retaliation after The Black Eagles found out that former admiral Anvent Eturrer had become a member of house Kador’s entourage. Empress Jamyl herself would gladly allow the Gallente to remove a political rival, and thus she agreed. Immediately President Foiritan ordered the Gallente Navy into Kador space to retrieve the reviled traitor, but ordered his forces to leave most of the military assets of house Kador intact, depriving Empress Jamyl of her victory-by-proxy. The fate of Anvent Eturrer became the most extreme manifestation of Gallente justice ever displayed publicly. 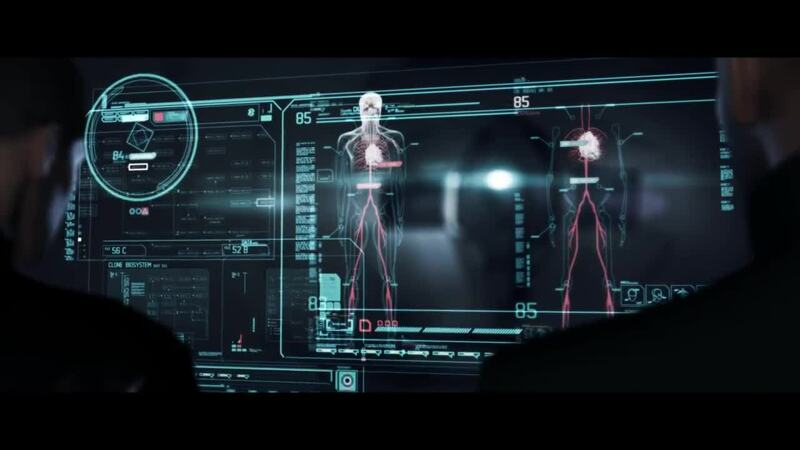 To reflect the will of the people, Anvent Eturrer was injected with nanites that would agitate in response to sound. Citizens who followed the proceedings live were told that they could make him burst into flame if they screamed their accusations at him. The collectively produced noise was focused at the pilloried Anvent Eturrer, and “by the will of the people” he was burned from the inside. Thus Souro Foiritan consolidated his political reputation. During his administration, an Amarr attack was repelled, he had neutralised his main opponent by removing him from the senate and brought the great traitor Anvent Eturrer to justice without dirtying his hands. He did, however, lose all that political credit again when the Caldari State Protectorate capsuleer militia successfully retaliated against the Gallente forces and conquered virtually all the border systems between the Federation and the State. The Gallente administration responded to that dire situation by issuing an order to nationalize all arms manufacturers in an effort to directly support the war. Jacus Roden – owner of Roden Shipyards – actively refused to comply. When it became evident that his industrial empire could sustain itself at least temporarily on sales to capsuleers alone, other corporations followed suit. Furthermore, such a crass interference by the government threatened President Foiritan with impeachment by the senate. Rather than facing such charges, he resigned. Jacus Roden, however, managed to cast himself in the role of the successful entrepreneur who had resisted an unlawful nationalisation and ran for office himself. Promising to dedicate the industrial capacity of his corporation to the war effort after all, he won the election. Meanwhile, Tibus Heth came to realise that ruling is far more difficult than conquest. After a generation of Gallente occupation, Caldari Prime had very much become a Federation world; insurgent movements resisted the occupation all over the planet while capsuleers kept harassing the defense fleet still stationed in orbit. Most disturbingly, the Provist conquerors were not only resisted by Gallente, but also by ethnic Caldari, descendants of those who had remained in the aftermath of the evacuation more than a century ago. A prominent leader of this joint resistance was Shailee Ramnev, the daughter of a Gallente woman and an Ishukone corporate citizen. Years later, she would become an important political figure and presidential candidate. Faced with such strong resistance, the forces of Tibus Heth became increasingly repressive and the Caldari corporations began to doubt the practical merit of the occupation. To appease the corporate boards, Tibus Heth took the bold step of authorising a Providence Directorate auction which would give the highest bidder exclusive rights to develop any system captured by State Protectorate capsuleers. While that may have had the desired effect, the general populace of those systems was anything but welcoming; especially on the Intaki homeworld, where widespread unrest followed the announcement that their system would become the property of Ishukone corporation. While failing to stabilise the Caldari State internally, Tibus Heth now also faced a much more assertive administration on the Gallente side. 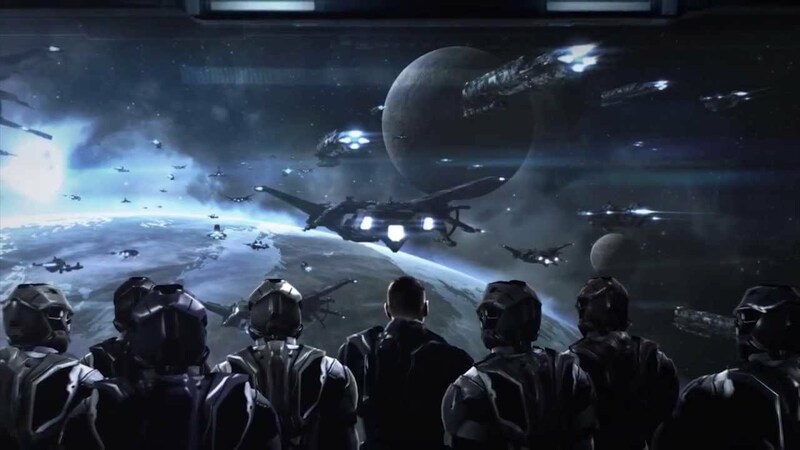 Jacus Roden’s campaign platform had also included the promise to retake Caldari Prime, and his support for the Federal Defense Union militia resulted in many new capsuleers joining the Federation’s cause. Soon the Gallente capsuleers drove their Caldari counterparts out of many captured systems and thereby turned the Providence Directorate’s license for corporate development of the region into a farce. Interestingly enough, the Intaki refused to accept full Gallente control of their homeworld. Despite the initial panic in the aftermath of the Provist auction, the Intaki Assembly came to terms with Ishukone corporation and the mercenary group Mordu’s Legion. Ishukone would only provide shipping and economic development while the independent forces of capsuleer Muryia Mordu became the protective military. When the Gallente reclaimed Intaki, they were simply told that Federation Navy protection was neither required nor wanted. The tug of war continued and even saw the involvement of capsuleer alliances previously unaffiliated in the war. The real turning point came when the Amarr made a momentous discovery in YC 113 which lead to a new breakthrough in military technology. Inside an ancient construct in faraway Anoikis, explorers discovered relics which provided the means to integrate infomorph technology directly into a human clone. No longer would transfer of consciousness be the sole ability of capsuleers, infantry soldiers could be augmented in a similar way. This lead to the creation of elite warriors whom the Amarr empire employed with great success during a battle in Heimatar. Soon the method to create such clone soldiers fell into the hands of New Eden’s other nations and with that Jacus Roden saw the opportunity to make good on his election promise to retake Caldari Prime. Under highest secrecy, the Federation prepared Operation Highlander, a concerted effort between Gallente military, loyalist capsuleers and the new clone soldier troops. All Jacus Roden needed was a legitimate reason to attack, which Tibus Heth provided him with in YC 114. 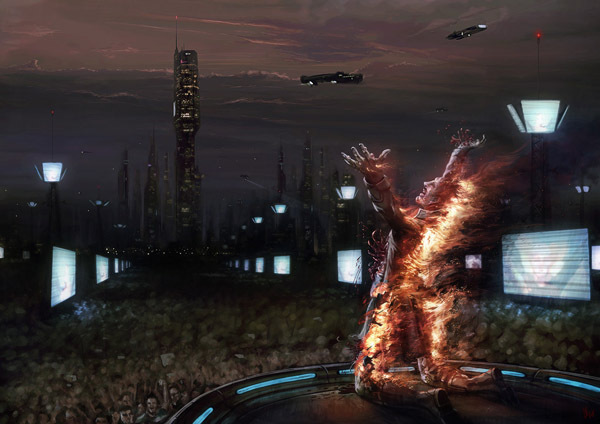 After rebels on Caldari Prime bombed the headquarters of the Providence Directorate, the Caldari leader decided to deal with the insurrection once and for all. He ordered the Leviathan Shiigeru into low orbit to prepare for orbital strikes against rebel targets. CONCORD became aware of this and sent a ship to investigate what appeared like a possible breach of regulations which forbid open warfare within national borders. Unwisely, the Caldari admiral in command, Visera Yanala decided to engage the CONCORD vessel which she considered in violation of the Caldari no-fly zone. As a result CONCORD declared a state of emergency and Jacus Roden managed to convince them that the Federation could provide a resolution. With that, a Gallente attack on Caldari Prime was officially sanctioned. The battle itself became the largest combined operation of official navies and capsuleer forces. Even the contingents of mighty alliances from faraway nullsec territories joined on both sides. On the planet, Provist forces held their ground as they deployed their own clone soldier forces, but the battle was decided by the destruction of the Shiigeru. Being in low orbit, the mighty Leviathan plummeted to the planet’s surface once its gravitational stabilisers failed. The impact devastated the southern tip of the Kaalakiota mountains but luckily it missed the city of Arcurio by 700 kilometers and caused only minor damage there. It later became known that capsuleer admiral Visera Yanala had intentionally guided the ship during its fall as best as she could to avoid the loss of civilian lives. In the aftermath of the battle, Ishukone corporation approached the Gallente administration with a proposal for the permanent demilitarisation of Caldari Prime. Jacus Roden agreed to it, and followed the advice of Ishukone CEO Mens Reppola to present it to the Chief Executive Panel (CEP) instead of Tibus Heth for ratification. That political entity, which comprised the directors of the eight largest megacorporations, was still the highest official authority of the Caldari State, and much to Tibus Heth’s anger, they took a majority decision to sign the demilitarisation agreement. Instead of either State or Federation, Mordu’s Legion became the protection force of the planet, just as they had on Intaki. The furious Tibus Heth reacted with drastic measures. He declared that all megacorporations must be nationalised to finally unite the Caldari State under his rule as Chief Executor. When a similar step spelled trouble for Souro Foiritan three years earlier, it was political suicide for Tibus Heth considering that Caldari society was founded on corporate independence. Adding to this controversial move, Tibus Heth also forced Admiral Visera Yanala to drink poisoned tea in atonement for her failure at Caldari Prime. Because Admiral Yanala had been a widely popular commander, the CEP demanded an explanation from Tibus Heth, but he refused to attend the official hearing. Rather than justifying himself, Heth gathered his most loyal cadres and proceeded to take over Caldari Construction facilities at Haatamo in a stated last-ditch effort to take back Caldari Prime yet again. For the corporate leaders, Heth finally went too far and the CEP declared his acts an insurrection against the Caldari State. They stripped him of his office as State Executor and nullified all his corporate shares. The Caldari navy was dispatched to put the Haatamo occupation to an end, and after eight days of siege they reclaimed the facilities. Tibus Heth, however, managed to escape together with a contingent of the Templis Dragonaurs, his personal protection force. The Chief Executive Panel finally decided to dissolve the State Executor office and the Providence directory. 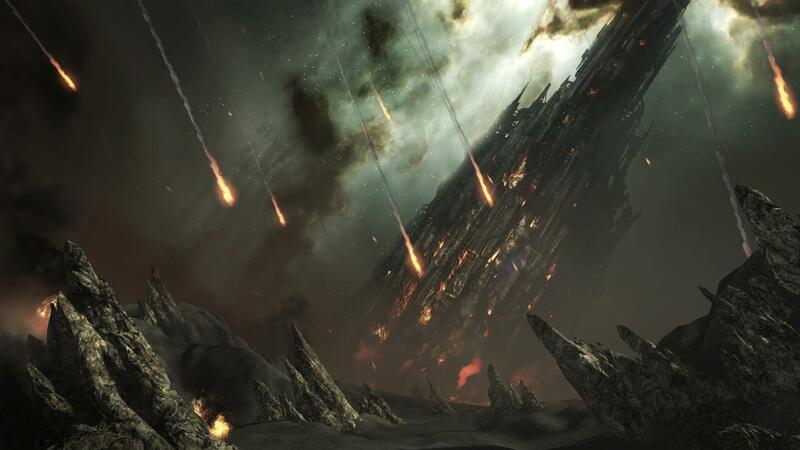 Tibus Heth and his fugitive supporters were last spotted in Black Rise by Caldari Navy forces and later the wreckage of his fleet was discovered in Aivonen. It was unknown who had destroyed them, but several capsuleer militias and outlaws had been implicated. The body of Tibus Heth himself was never found, but a prized personal watch of his was recovered from the debris. With that, all major conflict between the Gallente Federation and the Caldari State came to an end. Capsuleer militias still continue to contest the border-regions between the two powers, and Jacus Roden only recently cautioned during his re-election campaign that the Provist threat is not yet gone. Many capsuleers and Caldari citizens remain sympathetic to the cause of former State Executor Tibus Heth, but in this present day, events of a much more sinister nature have begun to capture the attention of authorities on both sides. The following list includes further reading and references used for creating this series of articles. It is not complete but more than enough to provide an entry point for your personal exploration of the backstory. I want to thank all the writers who provided me with material that made this series possible, in particular Mark726 for detailing the Operation Highlander site and my corpmate Aedre Lafisques for compiling some recent news items I had missed.